In 1996, The Base was released by Georg Buol. 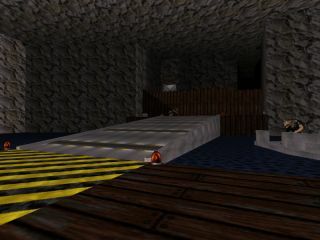 The third level in the Orbital Oblivion episode, GnuStella Network is an absolutely top-notch level from resident mapper Fernando. 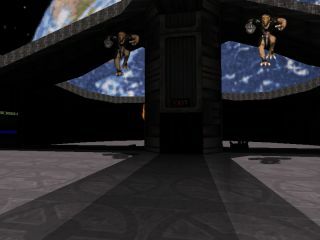 Design and architecture are superbe with very clever use of rooms-over-rooms and spritework - as a result the level connects up with itself quite satisfyingly, if that makes any sort of sense. Texture use is great and shadows are nicely realistic, which are always a plus. Fernando has deftly combined intense gun battles with problem solving; there's some very neat puzzles worth looking out for. I admit to having to restart the level because I blew up a control room support column and then legged it without stopping to survey the damage - but I won't give too much away. Check out this excellent map today! THIS LEVEL IS NEITHER MADE BY OR SUPPORTED BY 3D REALMS. Misc. Author Info     : 18 years old student from Concepción, Chile. Been playing Duke Nukem 3D since April 1996. Introduction          : Orbital Oblivion; Level 3.
the User Maps option and launch as usual. MOOD5.MID to DETHTOLL.MID to play the music. abovementioned e-mail address for more info. Page generated in 4.8127 seconds.